Published on February 15, 2019 by Martyn. Be the first to comment! 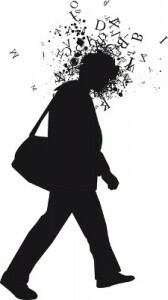 My interactive story, “The Virtual Disappearance of Miriam”, is to be discussed in Postdigital Storytelling: Poetics, Praxis, Research, an academic book written by Dr Spencer Jordan, Assistant Professor of Creative Writing at the University of Nottingham, and due to be published by Routledge later this year. 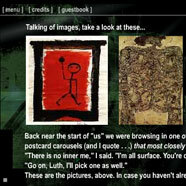 The story – a collaboration between me and designer Andy Campbell – was originally commissioned and published online in 2000 by the Ilkley Literature Festival, in conjunction with Route Publishing, and is regarded as a key hypertext in the early development of digital, interactive narrative fiction in the UK. It’s smashing to think that the story is still being read and studied nearly 20 years after it was written! Published on January 19, 2019 by Martyn. Be the first to comment! 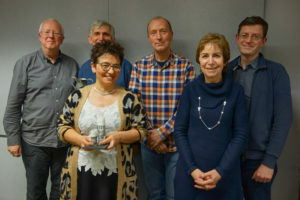 It was prize night at Leeds Writers’ Circle last week, when I was honoured to hand out the awards in my capacity as judge of the group’s annual short-story competition. LWC is a long-established and thriving writing group with more than 60 members and it was a difficult task to whittle down the many very good entries and select the best ones – and even more daunting to be asked to provide verbal feedback on their work in front of everyone at the awards event! As it happens, the evening – held at LWC’s regular venue, The Carriageworks, in Millennium Square – couldn’t have been more enjoyable or convivial. Here I am (centre), pictured with the winners and runners-up. Photograph courtesy of Bob Hamilton. Published on December 22, 2018 by Martyn. Be the first to comment! 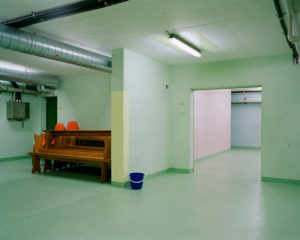 My latest short story is newly published online as part of an innovative project that pairs writers and photographers to produce pieces of fiction and accompanying images for use in hospitals working with stroke patients. A Thousand Word Photos has been conceived and set up by Ben Lambert (creator and editor) alongside Alexia Singh (photographic editor), with the idea of commissioning 1000-word short stories inspired by photographs – in my case, an intriguing and atmospheric shot of a basement storeroom, taken by the internationally renowned, award-winning photographic artist, Chloe Dewe Matthews. Using this as my starting point, I wrote The Interaction, a Pinteresque piece in which an unnamed protagonist is subjected to interrogation. The procedure is the same as always. I am escorted to the Interaction Room and made to sit at the desk, facing the glass screen that divides both desk and room. My escorts retreat but do not leave. After the customary wait, my Interactor lets himself into the other half of the room, briefcase in hand. He sits opposite me, shaved head gleaming beneath the spotlights that enclose us in white haze. His suit shimmers like a seal’s pelt. The screen holograms my reflection over his face, as if we are one entity. This thought hasn’t struck me before but I daren’t let it distract me: it might be months until my next Interaction – assuming this one ends in failure, as the others have done. I shut that thought down, too. In addition to being published online, the stories selected for the project are read aloud to stroke patients at hospitals by professionally trained actors working with the charity InterAct Stroke Support to aid recovery through creative stimulation. To read my story in full, click here. You can also view some of the other photographic images and their accompanying stories by following this link to the A Thousand Word Photos website. Published on November 21, 2018 by Martyn. Be the first to comment! I’m pleased to announce that one of my short stories has been given a new lease of life by being published for the second time. “The Wrong Coat” appears in Reflections, the newly launched anthology published by Cleckheaton Literature Festival and featuring prose and poetry from writers who have taken part in the festival. My story was originally published in Journeys: a Space for Words (Indigo Dreams Publishing, 2016). Published on October 6, 2018 by Martyn. Be the first to comment! I’m looking forward to a trip to the north-east next weekend to take part in the prestigious Durham Book Festival – my first gig there in nearly twenty years. I’ll be reading from and discussing my short-story collection, Letters Home, and sharing a stage with Jacqueline Crooks (The Ice Migration) and Colette Snowden (The Secret to Not Drowning) in a panel event chaired by Kevin Duffy, founding editor of Bluemoose Books. The event is organised by the Northern Fiction Alliance, a radical collective of independent publishers based in the north of England, showcasing work from Bluemoose (Hebden Bridge), Peepal Tree Press (Leeds) and my own publishers, Comma Press (Manchester). Durham Book Festival, which attracts tens of thousands of visitors, is now in its 29th year. The 2018 festival runs from October 6th to October 14th and includes some stellar figures from the world of literature: Pat Barker, Sarah Waters, Carol Ann Duffy, Simon Armitage, Sarah Perry, Kate Mosse, Alan Johnson and Andrew McMillan, to name just a few. Our session will be in the Burlison Gallery at Durham Town Hall, from 4.00-5.00pm on Saturday October 13th. Tickets, priced £5/£4, can by booked by phone or online – please follow this link to the event’s page on the festival website for more details. Published on September 25, 2018 by Martyn. Be the first to comment! I’m very pleased to be sharing a stage (again) with my good friend and fellow writer, Mandy Sutter, at a gig in Hebden Bridge next week. 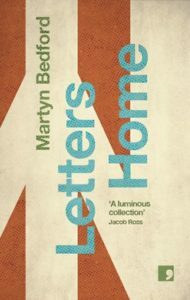 In a reprise of our recent “Mad, Bad & Sad” event in Ilkley, we’ll be reading from our story collections – Letters Home (Comma Press 2017) and Bush Meat (New Welsh Rarebyte 2017) – and discussing what draws fiction-writers and readers to dark and disturbing subject matter. The event is at 7pm on Thursday October 4th in Hebden Bridge Library, Cheetham Street, Hebden Bridge, HX7 8EP (doors open at 6.30.) There will be plenty of time for audience questions and we’ll be signing copies of our books, and generally mingling, afterwards. Admission is free but tickets can be booked in advance – please click on this link for full details. Published on July 22, 2018 by Martyn. Be the first to comment! On (yet another) blistering hot summer’s day, I was glad of the chance to cool off in the air-conditioned surroundings of the impressive library at Notre Dame Catholic Sixth-Form College, in Leeds, to run a writing workshop. The session included Year 12 students from the host school and a visiting group of Year 10s from Corpus Christi Catholic College, also in Leeds. Part of the National Collaborative Outreach Programme (NCOP) in Higher Education, the workshop was organised in conjunction with Leeds Trinity University, where I’ve been teaching creative writing since 2009. Creative writing masterclass with internationally renowned novelist. 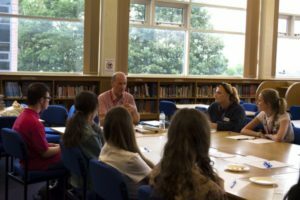 On Thursday July 12th, Notre Dame Catholic Sixth Form College invited students from our partner Catholic schools and A-level NCOP students to take part in a creative writing masterclass. The session was led by Martyn Bedford, senior lecturer in creative writing at Leeds Trinity University and author of eight novels. Martyn introduced the session by talking about some of his students who have gone on to enjoy successful careers linked to their English degree and as we looked through the college library we were delighted to stumble across a book by *Liz Mistry, who recently studied creative writing at Leeds Trinity University. Published on June 23, 2018 by Martyn. Be the first to comment! A commission to contribute an essay on creativity to a leading literature website has allowed me to explore an issue which has been on my mind recently: on the journey from wannabe writer to professional author, do you lose some of the freshness and freedom of expression that characterized your early, unpublished work? Can the act of writing be inhibited by the demands of being a writer? This is the topic I’ve chosen to write about in “Writing Myself into a Corner”, a 1500-word piece which has been published online in Collected, a weekly series of articles, essays and reflections by writers on the art and craft of the creative process, which is published by the Royal Literary Fund. In my twenties, I acquired the habit of rising early each morning to write for an hour before heading into work. Back then, I was unpublished, an aspiring novelist, more focused on writing than on becoming a writer. I already had a full-time job as a newspaper journalist, so my fiction writing had to be fitted into my spare time. I’m a morning person, hence the pre-breakfast regime. To begin with, I produced fragments: responses to prompts in creative writing books, character sketches, stand-alone scenes, abortive stories and novels. 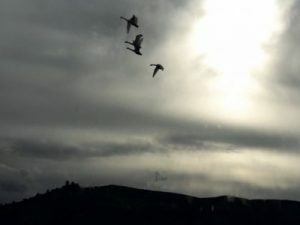 Often, I simply free-associated, scribbling the first thought that entered my head and seeing where it led, resulting in pages of stream-of-consciousness prose-poetry. Unreadable, for the most part. Some mornings, I would just gaze out of my window and describe whatever was going on — which wasn’t usually very much, at 6 a.m., in an East Oxford side-street. The milkman often featured in my embryonic work, recast as an MI5 agent (peeping tom, undercover cop, serial adulterer), his delivery round a front for his nefarious activities… or his existentialist musings, during my homage-to-Sartre phase. Nothing I wrote in that period made it into print. Rightly so. For the most part, it was amateurish, ill-formed, and immature; or, more generously, ‘developmental’. Publication wasn’t the point, though. These were experiments in creative process: flexing my imagination, putting words down any old how, settling into the rhythms of my mind and the motion of pen across page. The writing gurus I was in thrall to at the time assured me such methods were not an indulgence but indispensable to the true expression of my creative self. To read the piece in full, or to check out some of the other articles in the archive, please click on this link to the RLF website. I’m grateful to Collected‘s editor, Christina Koning, for commissioning, editing and publishing the essay. Published on June 14, 2018 by Martyn. Be the first to comment! 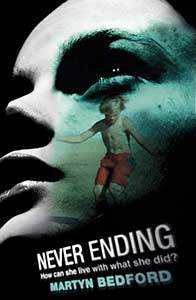 I’m pleased and flattered to hear that my young-adult novel, Never Ending, has been selected for inclusion in a nationwide reading promotion in schools. It’s one of 16 children’s and teen/YA titles to feature in the Building Bridges Conflict Resolution Book Group scheme organised by Cilip, the UK’s library and information association. The books will be distributed in reading packs designed to serve as a resource for primary and secondary schools across the country. The packs, which include activity guides and topic sheets for each title, aim to provide book-based discussion and activities to support conflict resolution, encouraging students to think about how bridges may be built between opponents and enemies of different kinds. Several leading lights of contemporary UK children’s and YA fiction feature in the promotion, including: Sam Angus, Malorie Blackman, Catherine Bruton, Brian Conaghan, Jenny Downham, Phil Earle, Zana Fraillon and Geraldine McCaughrean, so I’m honoured to see my name alongside theirs in such a prestigious scheme. Published on June 2, 2018 by Martyn. Be the first to comment! It’s rare that you get the chance to do a gig within walking distance of your home, so I’m looking forward to an easy stroll down to Ilkley Playhouse for “Mad, Bad and Sad” – an event which will explore the dark side of life (and fiction). 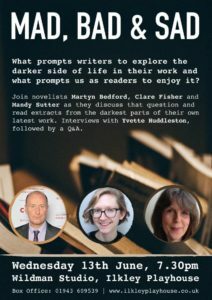 I’ll be sharing a stage with two other writers – my good friend, Mandy Sutter, and acclaimed debut novelist Clare Fisher – to give readings from our work and to discuss why so many writers, and readers, are drawn to stories which explore the sordid and the seedy, the grim and the gruesome, the traumatic and the tragic. Clare’s first novel, All the Good Things, was published by Penguin last year – described as “a sparkly and unsettling debut” by The Guardian – and her collection of short fiction, How the Light Gets In, is out this month. I’ll be reading excerpts from my own story collection, Letters Home (Comma Press, 2017), in which themes of loss, absence and isolation recur (not to mention death, violence, racism and depression). A cheery evening in prospect, then. The event will be chaired by local journalist and author Yvette Huddleston, the books editor of the Yorkshire Post, and there will be time for questions from the audience. “Mad, Bad and Sad” is at 7.30pm on Wednesday June 13th, in the Wildman Theatre at Ilkley Playhouse. Tickets are £6 from the Playhouse box office and the venue advises advance booking, either online at www.ilkleyplayhouse.co.uk or on 01943 609539. Here’s a direct link to the event page on the Playhouse website.